Betsy and I enjoy visiting the Smokies just about any time of the year, but winter is probably our favorite time to visit. One reason is that there are usually fewer people around during winter, Another reason is that the streams in the park usually have a good amount of water in them, and we love hiking along the river banks. 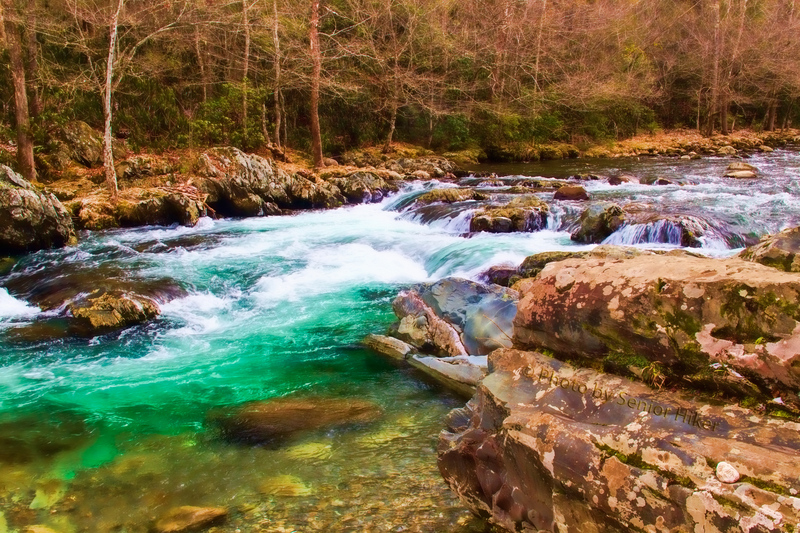 A couple of years ago we were hiking along the West Prong of Little Pigeon River in the Greenbrier section of the park. I used Photoshop to convert a photo of the stream into a ‘painting’. As you know, My Beautiful Bride and I grow roses. We also take many photos of our roses since each blossom seems to be uniquely beautiful. Although I think some of my photos are very good, at times I like to experiment with a picture just to see what happens. 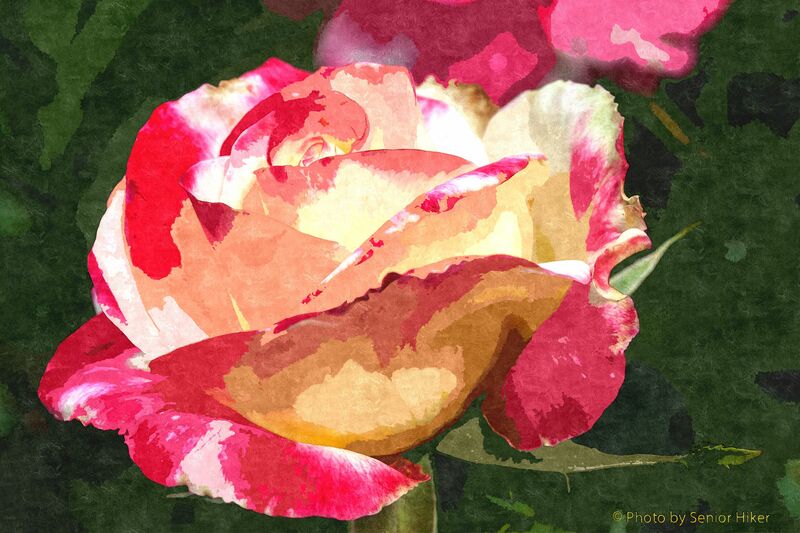 I used Photoshop to transform a picture of our Something Special rose into a painting. I rather like the result, and I hope you do, too. Betsy and I think our roses are beautiful at any time, but I really like the way they look after a shower. 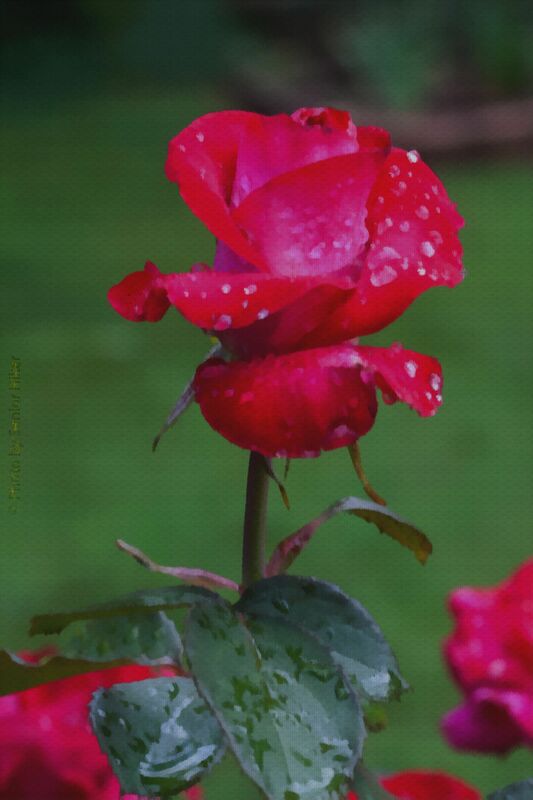 I got this photo of our Ronald Reagan rose after a June shower a couple of years ago. A long-time favorite rose of both Betsy and myself is Double Delight. 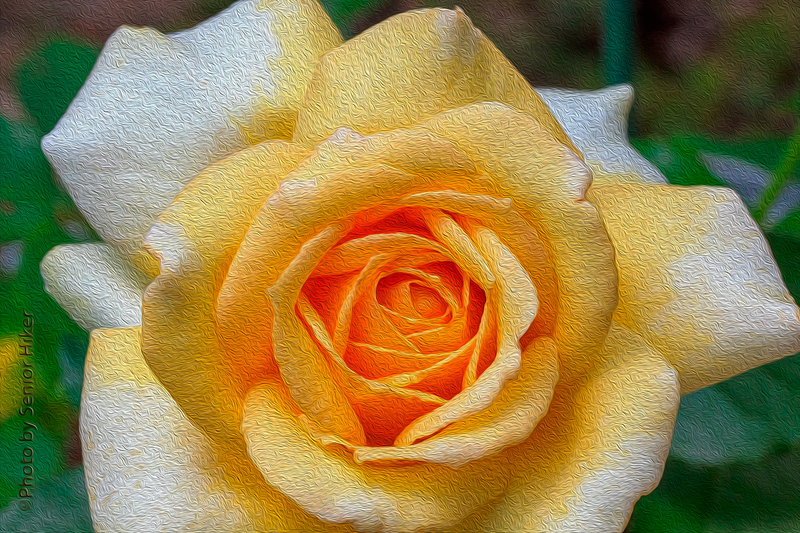 We’ve had it in our garden for as long as we’ve had roses here in the Glade. The colors are gorgeous, and the fragrance is delightful. 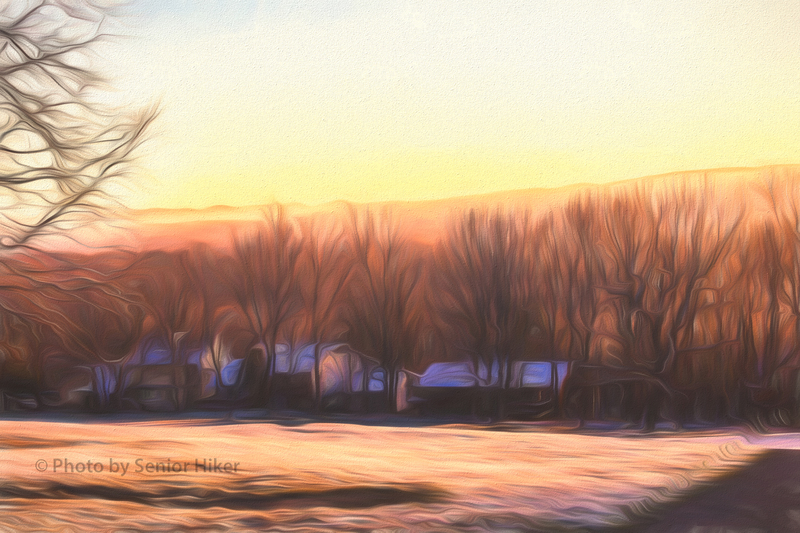 I took the photo of Double Delight several years ago, but then used Photoshop to turn the photo into a painting. Once our iris start blooming we can be relatively certain that Spring has come to stay. 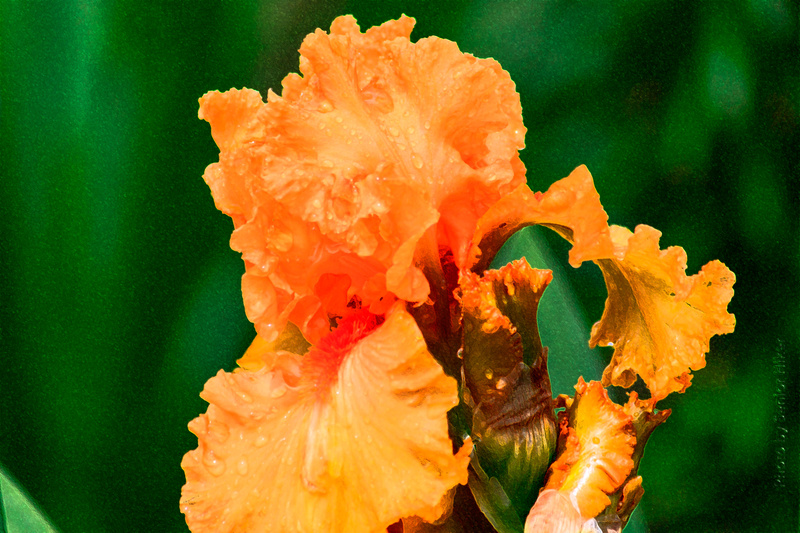 This beauty is named Orange Harvest, but it is a welcome splash of April color. The picture upon which this ‘painting’ is based was taken several years ago, but Orange Harvest is still putting on a show in our yard. I captured this photo on an early morning January walk on the golf course. Although the scenery wasn’t particularly attractive, I did like the light on the trees and the ground. I played around in Photoshop to turn the photo into a ‘painting’, and got this as a result. 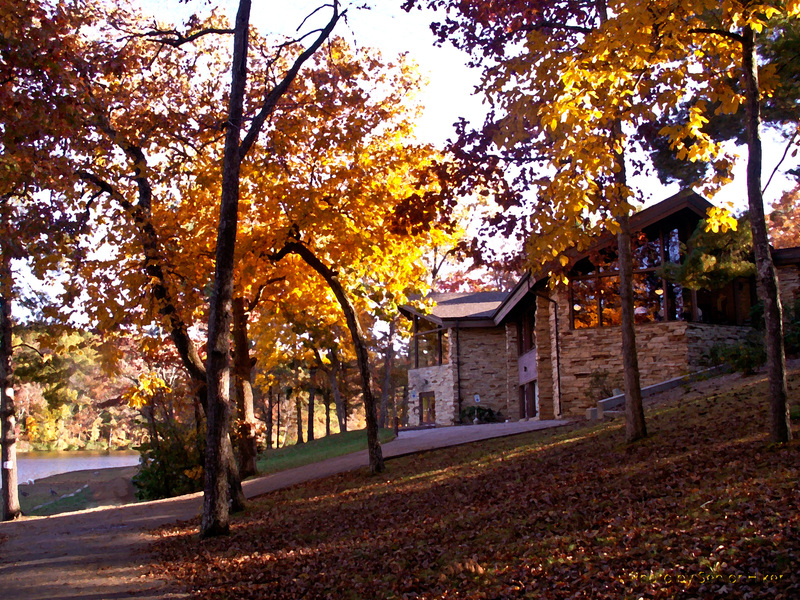 I took this photo at Cumberland Mountain State Park near Crossville, Tennessee, several years ago. I played with the image in Photoshop, attempting to make the photo look more like a painting. I’ve never thought of myself as being particularly creative, but I’ve seen some composite photos of the August eclipse, and thought it would be interesting to see if I could create a composite of some of the photos I took that day. I’ve never done anything like this before, but I rather like the results of my first attempt. 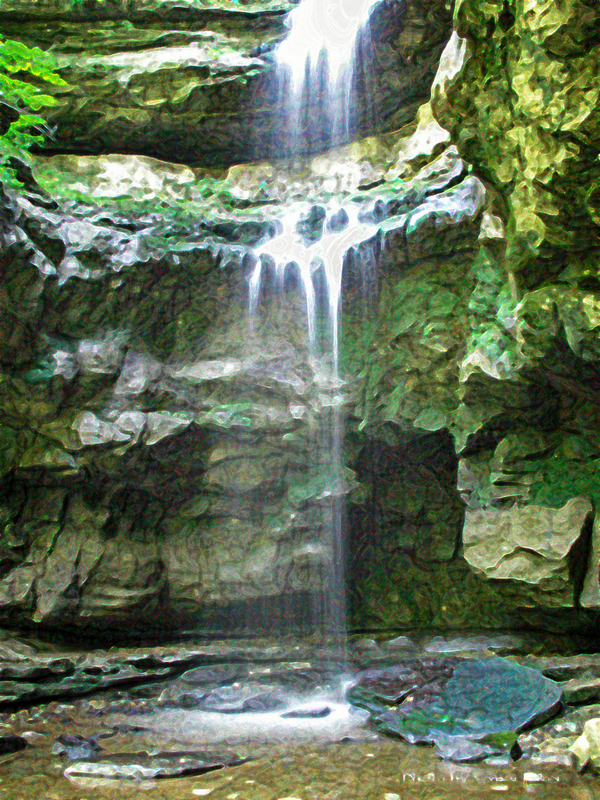 Betsy and I visited Lost Creek Falls here in Tennessee several years ago. It was a nice enough little waterfall, but I have never been impressed with the photos I got. So I recently played around in Photoshop with one of my photos and got this ‘painting’. I rather like this. 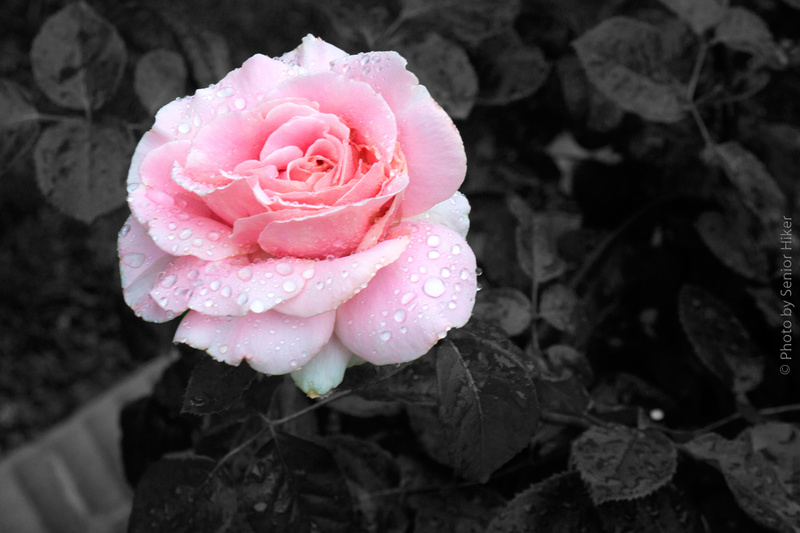 Sometimes raindrops can make a beautiful rose even more beautiful. I captured the soft pink blossom of Frederic Mistral a couple of years ago, but I have never published it. I thought now was about time.